Ever wish you could catch up on your scrapbooking? Let the A Year in Review Photobook Template help! 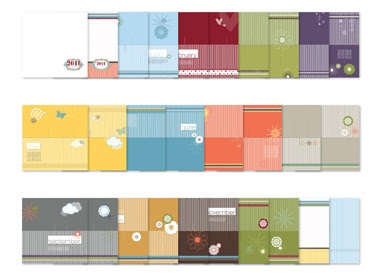 Already designed for the seasons, this exclusive-to-digital template will give your entire year a cohesive look. Simply insert your photos into the 12" x 12" 28-page designer template, personalize with journaling and voilà . . . you've completed an entire year! Use the wide range of elements included in the kit for other applications. It includes 12 Designer Series paper patterns, 24 embellishments, one punch, and a 32-piece stamp brush set with coordinating colours Bashful Blue, Basic Gray, Cherry Cobbler, Daffodil Delight, Early Espresso, Elegant Eggplant, Marina Mist, More Mustard, Old Olive, Pear Pizzazz, Sahara Sand, and Tangerine Tango. Want to find out what other new were offered from Stampin' Up! last week?